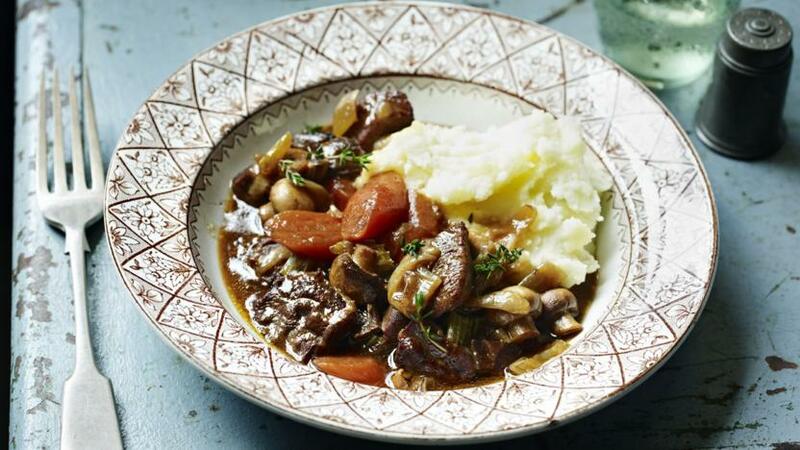 Mary Berry's beef stew is smart enough to serve for a dinner party. Serve with mash or potatoes dauphinoise and green vegetables. Cut the beef into 2.5cm/1in chunks and trim off any excess fat. Place the flour on a plate or in a plastic bag with plenty of salt and black pepper and toss the meat in it until well coated. Heat the oil in a large flameproof casserole and add the beef. Fry until browned on all sides - you may need to do this in batches, as you don’t want to over-crowd the pan. It is important to brown the beef and not stew it. 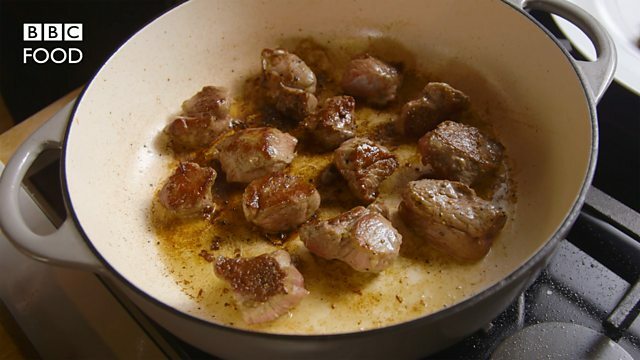 Remove the meat from the pan using a slotted spoon and set aside. Add the shallots, celery and carrots to the pan and fry for five minutes, or until softened a little. Meanwhile, soak the mushrooms in a bowl in 300ml/½ pint boiling water until softened. Drain, reserving the soaking liquid and chop the mushrooms into smaller pieces. Return the meat to the pan and add the red wine or stout. Bring to the boil for 4-5 minutes, or until the volume of liquid has reduced by about a third. Add the stock,soaked mushrooms and their soaking liquid and the thyme. Bring to the boil and then cover and simmer on a low heat for about 2½ hours, or until tender. If you prefer you can cook it in a preheated oven at 150C/300F/Gas 3 (130 fan) for the same time. Add the button mushrooms and the redcurrant jelly and cook for a further 30 minutes. Serve with mash. This can be cooked the day before, chilled in the fridge and reheated. To freeze, cool completely then freeze for up to three months. Defrost in the fridge overnight and reheat thoroughly. Shin of beef has a nice marbling of fat so will be meltingly tender, but any sewing steak or cuts will work well. If you want to thicken the sauce further, mix one tablespoon of plain flour with 2-3 tablespoons of cold water to make a thin paste, and add gradually to the boiling sauce until thickened to your liking.